Earlier this week, I mentioned I'm on a mission to finish it in 2013. Now who's ready to see the first finish? I started my Granny Square Quilt in the Spring of 2012 using this tutorial from Blue Elephant Stitches. I chose to use a fresh + cheery combination of fabrics -- all of which came from my stash -- and paired them with Kona white. 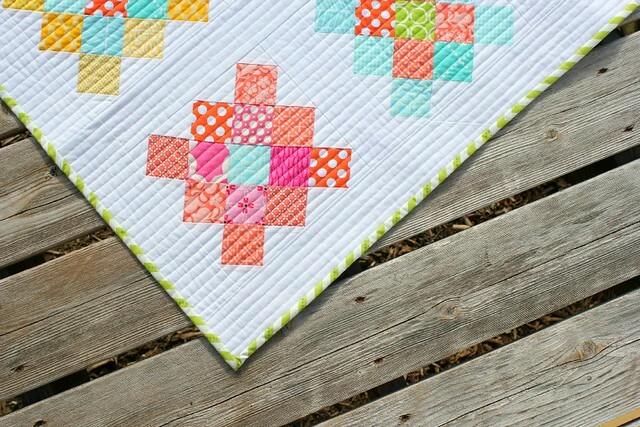 The colors just pop off the quilt and remind me of Spring! I straight-line quilted lines 1/2" apart using 50 wt Aurifil (color 2021) and my walking foot. The dense + close quilting took a while to finish but I'm so happy with the results! For those of you wanting to give straight-line quilting a try I say don't be intimidated and go for it! Make sure you use your walking foot, a new needle (I use a Universal needle, size 80/12), lengthen your stitch (on my machine I use a 2.5 or 3.0 stitch length), and use the "needle down" position, if your machine has the option. Most importantly make sure you quilt using a steady + constant speed -- I've found it helps keep my stitches straight. My favorite thing about this quilt is the binding! I've always loved the look of bias binding but I'm not a fan of making it. Well here's a fool proof way to achieve the bias binding look -- use zig zag or chevron fabric. The fabric I used for this quilt binding is from Simply Color by V and Co. It comes in gray (my favorite! ), green, egg plant, and orange. The scale on this zig zag print is perfect for 2 1/2" double-fold binding! You can find all four color ways at Pink Castle Fabrics and Fat Quarter Shop. Its beautiful. You have inspired me to finish mine now. Very fresh and pretty. I like doing strait line quilting but I have never done it with the "needle down" option. Thanks for the tip. That quilt just puts a smile on my face :) So happy! Oh, it is just fabulous!!! I love every detail, but especially that binding for the perfect choice in finishing! Megan, your Granny Square quilt is wonderful. Stunning!! 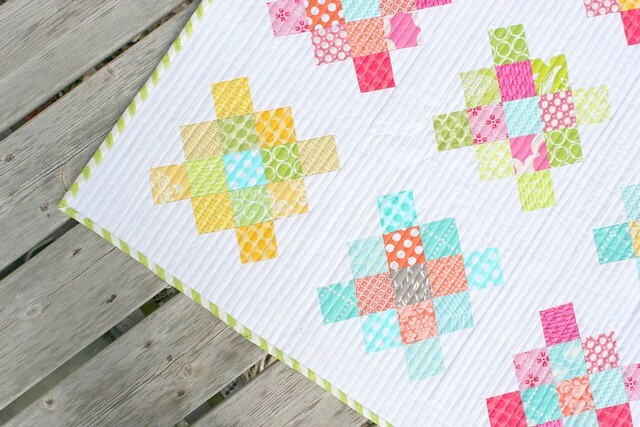 Love the colours and your dense quilting. Beautiful Megan!! I have lime green chevron binding on my favorite quilt...gives it so much character! this is beautiful. straight line quilting takes patience but definitely worth it. 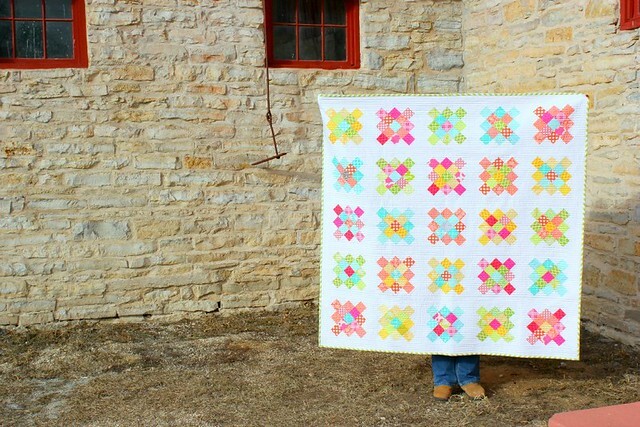 Megan, this quilt is an absolute knockout! 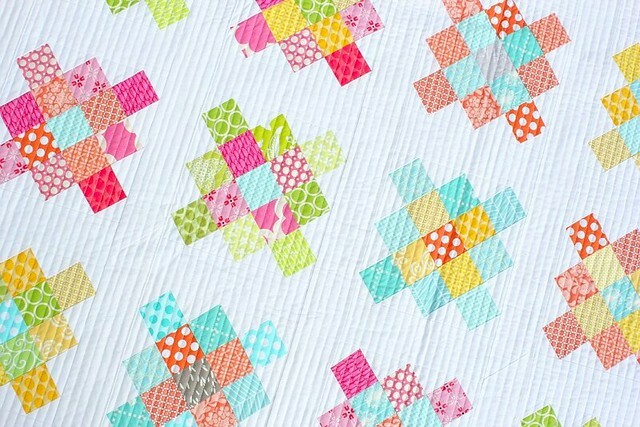 I love, love, LOVE the quilting, which adds so much texture! So what's your count so far this year Megan? You're a finishing machine!! It looks really stunning and I know how long that quilting takes as I just did the same thing on a quilt for my mum and it seemed to takes days! I started my grannies last spring and need to make some more as a granny finish is on my list too! It's a beautiful finish. Congratulations on getting this one done! I love it - it's such a happy quilt! I love granny squares. And what a great idea on the binding! Pretty quilt, I love the straight line quilting. i believe I will give it a try. Thanks for sharing. That is just awesome. I love the overall color effect. Nicely done. I am just so in love with these colors! And your quilting is the first machine quilting on this pattern that I've loved. Way to go! Quite a finish!!! I love this quilt! It's so fresh and pretty. Your quilting is fantastic and makes me want to give it a try. Love your blog - I'm a new follower! Oh I heart it so much! I really, really love this quilt despite the fact that I am sick of square patch quilts. This is truly spectacular, you hit the nail on the head here!! Oh, this is one of those patterns that didn't grab me at first, but has been growing on me. Now I'm sold! Just beautiful! So gorgeous on every level! Beautiful. Simple, clean, and refreshing. It keeps my interest, looking around the quilt, and the binding is so fun. I do this type of quilting a lot and love the effect. Thank you for taking the time to post this. Gorgeous finish! It is absolutely lovely. love this one, it's even prettier in person! Such a winner! I know that quilting took forever!!! This quilt is really, really pretty. I like the quilting. Thank you for taking the time to include all the quilting details.